Shortly after decorating our tree I undecorated the bottom 1/3, or to be more accurate The Bean undecorated the bottom 1/3. I am sure we are not the only family with a partially undecorated tree. It seems inevitable that any toddler would want to touch a shiny, pretty decoration on a cool tree right at their height in their house. Really, I wouldn't mind her touching the tree and decorations so much if they weren't glass and I wasn't so worried about them breaking and hurting someone. So to remedy our unbalanced tree situation, we decided to make some ornaments that were a little less fragile. The inspiration for these ornaments came via Pinterest, of course, from Katy Elliott: Home+Art+Food . We actually made the ornaments last week with the help of our friend Debbie. She and I did most of the gluing, using pasta wheels and tacky glue. The Bee made a collage gluing pasta to paper and The Bean had a blast sorting dry pasta into an ice cube tray. Debbie and I enjoyed making a variety of snowflake patterns and Debbie even came up with an awesome tree pattern. 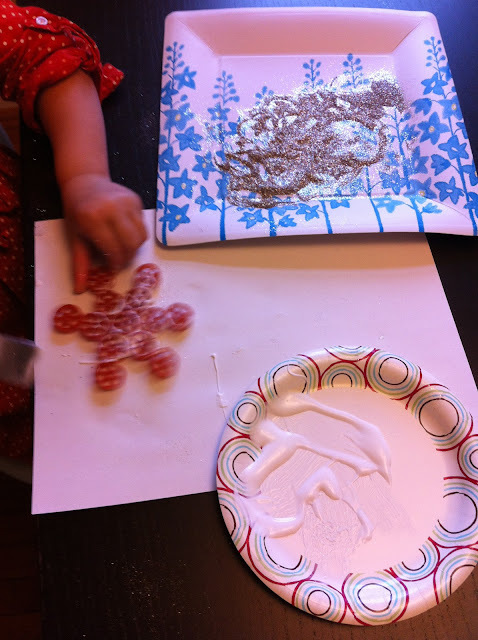 Once the glue had dried, I took the pasta ornaments outside and gave them a coat of silver or red spray paint. Then came the real fun, the glitter! Glitter is not my favorite but I knew The Bee would love it. So we set up a glitter station, she first painted each ornament with modge podge and then dipped them into a plate of glitter. She had the best time and despite her best attempts made the biggest mess. There was glitter everywhere, but I figure sometimes a little mess is worth it. I was able to vacuum up most of the glitter and we all just looked a little more festive for the rest of the day. 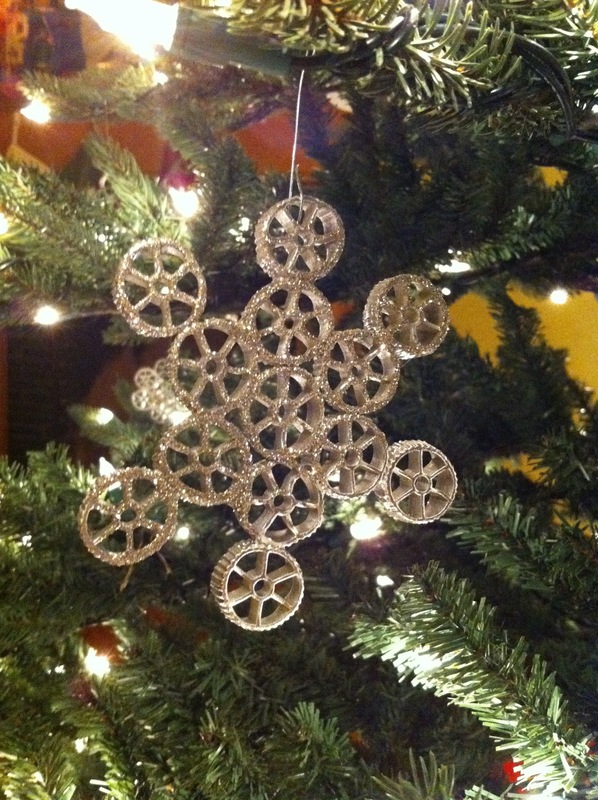 After the glitter and modge podge dried I just attached wire ornament hooks on the snowflakes and hung them on the tree. They look great, and I have no worries about them getting broken. They are surprisingly durable and we can always make more! Just hopped over from It's Playtime linky, this is a lovely idea, I bet they look gorgeous hanging on the tree. What a clever idea! and they look so lovely. I will have to add this kind of pasta to my shopping list. Thank you both! They do like good on the tree, hard to believe they are pasta! and even better they have survived a few trips off the tree too! You should consider it a huge compliment that I just glued pasta together to make an ornament! Thank you for the inspiration! We decorate the bottom of our tree with some ornaments that my son can take on and off. Even though he can reach some of the breakable ones, he only touches the ones he's allowed to touch (most of the time). Marnie- I do consider it a huge compliment! Will you share a photo of your ornament here (http://www.facebook.com/pages/A-Childhood-List/253660947990679) when you are done? I would love to see what you made!